Jazz knows no limits and no boundaries. It is a perfect blend of harmony and soul that captivates music lovers from around the world. Azerbaijan's jazz is associated with the names of such legendary musicians as Rafig Babayev and Vagif Mustafazade, the founders of a new jazz trend jazz-mugham. This unique genre develops from mixing Azerbaijani jazz with mugham. Today, national jazz musicians are winners of many international jazz festivals and competitions. Azerbaijan is a home to one of the biggest jazz festivals. Baku International Jazz Festival has opened in Baku with spectacular concert. The festival brings together the incredible musical talents who have made their mark in the world of jazz. This year’s line-up includes a British soul singer and composer Omar Lye-Fook. 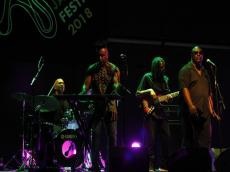 Spectacular concert of the soul singer took place at Electra Events Hall on October 14, which marked the beginning of the festival, Trend Life reported. The name of Omar Lye-Fook is well-known to jazz lovers, the singer has performed at various international competitions and festivals. His most well-known song was his debut single "There's Nothing Like This". It reached number 14 in the UK Singles Chart on re-release in 1991. AllMusic noted that he is described by some as the father of British neo soul. The musician wowed the audience with his impressive performance. His music plunged the audience into the mysterious world of soul and funk music. Honored Artist of Azerbaijan Hasan Bagirov (St. Petersburg) and pianist Leonid Ptashka (Israel) will perform at the International Mugham Center on October 15. Rotunda Jazz Club invites you to enjoy spectacular concert of German saxophonist and composer Uwe Steinmetz on October 16. Estonian singer Laura Poldveren will give a concert at Rotunda Jazz Club on October 19. French Jean Cholet trio (October 29) and the Swedish band "Music, Music, Music" (October 21) will delight you with superb performance. Elvin Bashirov's band will perform a concert at the Rotunda Jazz Club on October 22. Martin Salemi Trio (Belgium) will perform in Baku on October 24. Moreover, the concerts of Helge Lien Trio (Norway) and Michael Pipoquinha (Brazil) await jazz lovers on October 26. The final concert will be held at the International Mugham Center. Famous US musicians Grégoire Maret and Christie Dashiell will perform at International Mugham Center on October 28. Within the framework of the festival, International Jazz Contest will be held on October 15-18.